Pfeiffer Vacuum is a leading supplier of vacuum solutions. The product portfolio is marketed under the Pfeiffer Vacuum and adixen product brands and includes all components and systems for vacuum generation, measurement, analysis and leak detection. The products of both brands complement each other perfectly so that we can offer clients customized vacuum solutions that are tailored to their individual requirements. The name Pfeiffer Vacuum stands globally for innovative and customized vacuum solutions as well as superior engineering, expert consultancy, and reliable service. With our technologically advanced turbopumps and backing pumps, we set the standards in our industry. This claim to leadership will continue to be our driving force in the future. Our products cover a wide range of pumps including vacuum generation pumps, vacuum chambers, vacuum measurement and analysis equipment, installation components as well as complete vacuum systems. With the help of our products, vacuum pressure conditions similar to those in outer space are created which are essential for research, various industrial processes, and for manufacturing many everyday objects. We are a machine engineering company that designs high-tech products of the highest quality and manufactures them predominantly for export markets. Besides the two main design and production sites in Asslar, Germany, and in Annecy, France, the Pfeiffer Vacuum Group has an extensive network of its own sales and service companies. The Company’s primary markets are in Europe, Asia and the USA. 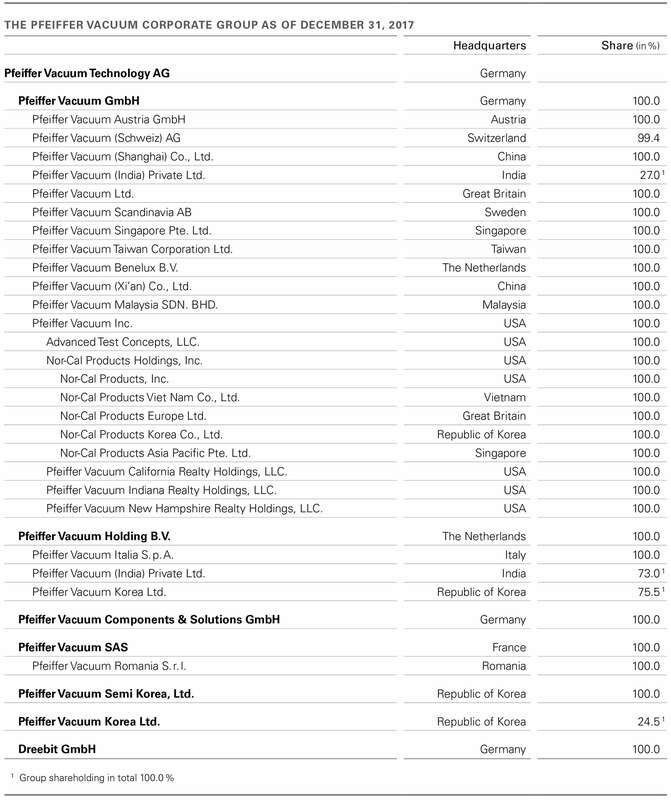 As of December 31, 2017, 32 companies belonged to the Pfeiffer Vacuum Group compared to 21 in the previous year. The following companies have been acquired during this fiscal year: Nor-Cal Products Holdings Inc., Yreka, California, U.S. and its subsidiaries as well as Advanced Test Concepts LLC., Indianapolis, Indiana, U.S. and Dreebit GmbH, Dresden, Germany. Additionally, in connection with property acquisitions in the U.S., a total of three real estate companies were established. Furthermore, Pfeiffer Vacuum Malaysia SDN. BHD. was founded in Kulim, Malaysia. adixen Vacuum Technology (Shanghai) Co., Ltd., China, was liquidated. Pfeiffer Vacuum GmbH, Asslar, Germany, and Pfeiffer Vacuum SAS, Annecy, France, play a central role in the Corporate Group. Pfeiffer Vacuum GmbH organizes the development and manufacture of all Pfeiffer Vacuum products, is the distributor for Germany and also manages central equity investments for the Corporate Group. As at December 31, 2017, the Company employed a total of 728 employees. Pfeiffer Vacuum SAS is, in a sense, the French equivalent of Pfeiffer Vacuum GmbH. The Company employed 667 employees at year’s end, is the main development and production facility for adixen products, and is responsible for sales in France. A total of 1,395 employees work in these two companies. This represents nearly half of all workers employed in the entire Corporate Group (2,945 at the end of 2017). What is more, Pfeiffer Vacuum Components & Solutions GmbH, Pfeiffer Vacuum Semi Korea Ltd., and Pfeiffer Vacuum Romania S.r.l. are tasked with the manufacturing and assembly of own products. As a result of the acquisitions that took place during this fiscal year, the number of corporate subsidiaries with their own production sites has increased. To be mentioned in particular are Nor-Cal Products, Inc. and Advanced Test Concepts, LLC., as well as Nor-Cal Products Viet Nam Co., Ltd. The remaining Corporate Group companies are legally independent corporations that are active in sales and service tasks. Essentially all companies are legally organized in a form that can be compared to a German limited liability company (GmbH). The subscribed capital of Pfeiffer Vacuum Technology AG as at December 31, 2017 was unchanged at K € 25,261 and consists of a total of 9,867,659 no-par bearer value shares. There are no different classes of shares currently or previously existent, so all shares have the same rights, in particular the same voting and dividend entitlement rights. Accordingly, the calculated share of the subscribed capital amounts to € 2.56. Amendments to the Articles of Association can be decided at the Annual General Meeting by a simple majority of voters present at the meeting unless the law mandates a larger majority. To our knowledge, there are no restrictions with regard to voting rights or with regard to the transfer of shares. 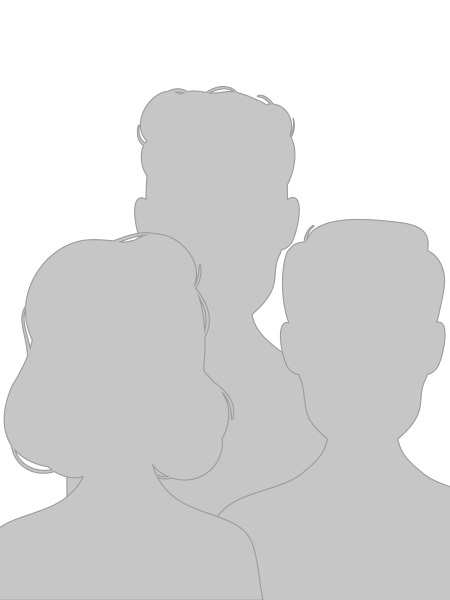 Management Board members, according to the Articles of Association and §§ 84, 85 German Stock Corporation Act (“AktG“), are appointed by the Supervisory Board for a maximum term of five years. Reappointments or extensions to the tenure period are permitted for a maximum of five years in each case. Through a resolution of the Annual General Meeting on May 23, 2018, the Management Board was authorized to increase the subscribed capital once or repeatedly by € 12,630,602.24 or 4,933,829 shares, in exchange for cash or contributions in kind (Authorized Capital 2018). This authorization is valid until May 23, 2023 and requires the consent of the Supervisory Board. According to the resolution of the Annual General Meeting on May 22, 2014, the Management Board is authorized to issue fractional bonds with option or conversion rights or conversion obligations, profit participation rights or participating bonds (or combinations of these instruments) with an aggregate nominal value of up to € 200,000,000.00 and to grant the holders conversion rights for up to 2,466,914 no-par bearer shares of the Company having a pro-rata amount of up to € 6,315,299.84 of the share capital. This authorization is valid until May 21, 2019, and requires the consent of the Supervisory Board. At the Annual General Meeting on May 21, 2015, the shareholders authorized Pfeiffer Vacuum to buy back treasury shares in accordance with § 71 Sub-Para. 1, No. 8, German Stock Corporation Act (“AktG“). This authorization covers the buyback of a proportionate amount of the Company’s share capital of up to € 2,526,120.70 (986,766 shares, representing 10 % of the share capital at the time the resolution was adopted), requires the consent of the Supervisory Board for execution and is valid through May 20, 2020. The Corporate Group does not own treasury shares as at December 31, 2017 and 2016. Products from Pfeiffer Vacuum are employed in numerous industry markets. Over 14,000 customers trust in the reliability of our products. Pfeiffer Vacuum divides these customers into the following markets: semiconductor, industry, coating, analytics, and research & development. As far as the positioning of these markets is concerned, only a limited amount of data is available regarding the size of the entire market and individual market segments. Based on surveys conducted by the German Engineering Federation (VDMA) as well as our own estimates, we expect to take the leading market position in the market segments of industry, coating, analytics, and research & development. In the semiconductor market segment, we should rank second. Without vacuum technology, a number of innovative processes would be inconceivable, such as in nanotechnology, in producing LEDs or in scientific research. Many of these new technologies create innovative products and production processes. Strong advances in people’s personal and professional communication patterns, for example, are bringing forth ever more new technologies in the semiconductor industry. The rising demand for energy coupled with the need to conserve resources is leading to a steadily increasing amount of new developments in the field of energy supply. These, and further social and industrial trends, are typically producing additional marketing opportunities for Pfeiffer Vacuum. Our strengths include the ability to serve all markets, which makes us largely independent of developments in individual market segments. In this segment, we combine a heterogeneous category of industrial customers who require our vacuum solutions for specific production steps. Industrial trends such as quality improvement, energy supply, and conservation, mobility or environmental protection are currently leading to new fields of application. Examples include metallurgy, tube production, as well as air conditioning and refrigeration technology. A further field of application is solar thermal energy. The absorber tubes needed for this technology are evacuated by using our pumping stations as well as continuously being tested for leaks with our leak detectors. Our customers in the industrial segment primarily come from Europe, as well as from the United States, and increasingly from Asia. Our largest customers in this market are so-called OEM (Original Equipment Manufacturer) customers, i.e. manufacturers of industrial systems or analytical instruments. Complex analytical devices such as scanning electron microscopes are primarily employed for industrial quality control. This industry is characterized in particular by megatrends such as Life Science, Biotechnology, and Security. Ever smaller and lighter portable analyzers are required in environmental technology, in security technology or for doping analyses. The analytical industry therefore typically requires small and medium-sized turbopumps along with backing pumps and measurement equipment. Our major customers in this market are located in the United States, Japan, the United Kingdom, and Germany. Collaboration with research facilities enjoys a long tradition at Pfeiffer Vacuum. Whether in physics or chemistry laboratories at universities, prominent research institutions like the Fraunhofer and Max Planck Institutes or in large multinational research facilities – all of them rely upon the quality and dependability of our mass spectrometers, leak detectors, or vacuum solutions. Working in close cooperation with research facilities in Europe, the United States, and Asia, new applications arise continuously in the fields of energy supply or healthcare technology. Without vacuum, many things that are used in daily life could not be produced in the desired quality. The antireflective coatings on eyeglass lenses, the coatings within flat screen manufacturing, the coatings on Blu-ray discs or on high-quality bathroom faucets and fittings as well as the coatings on solar cells or architectural glazing are produced in vacuum chambers, for example. High-quality tools are coated and hardened under vacuum to make them even more durable. One significant megatrend in this segment is the orientation towards regenerative energies, such as solar energy. What is predominantly required in the coating industry are medium-size and large backing pumps and turbopumps as well as measurement equipment and complete vacuum systems. Our customers are located in all industrial nations. The Management Board of Pfeiffer Vacuum Technology AG assumes responsibility for the strategic leadership of the Corporate Group. The Group companies were allocated to the business units “Semiconductor & Coating” or “Analytics & Industry” according to the focus of their operations and the market potential. They are directly subordinated to this business unit, and their comprehensive regional responsibility for all market segments continues to apply unchanged. All subsidiaries in the Group therefore have self-directed managements and essentially make their own decisions within central guidelines on how to attain the targets that have been defined by Corporate Headquarters and the business unit (sales, EBIT margin and earnings before taxes). The supervisory bodies of the subsidiaries, whose composition also includes members of the Management Board of Pfeiffer Vacuum Technology AG, the heads of the business units or Headquarters in Asslar, Germany, must be involved in the case of major decisions. All subsidiaries are steered by Corporate Headquarters in Asslar through the stipulation of annual sales and profitability targets (“Management by Objectives”), and thus primary steering lies with the legal entities in the regions. The achievement of these targets is monitored by means of detailed target/actual comparisons and variance analyses within the framework of monthly reporting, which was expanded to market information, to additionally take account of the requirements of the business unit structure. This ensures that undesirable trends will be identified and corrected early on. Monthly conference calls with the management of the subsidiaries additionally ensure that all business development questions are discussed. In addition, face-to-face meetings with staff at the local site are held by Group and business unit management. For countries in which Pfeiffer Vacuum is not represented directly through a subsidiary, the sales targets are agreed with the local distribution partner. Here, too, the achievement of sales targets is measured by means of target/actual comparisons. A further steering instrument consists of the variable remuneration of the local management of the non-German subsidiaries and of the sales staff. This sensitizes employees to cost structures, and so to the Company’s long-term success, even if they do not work in areas of the Company which have a direct influence on sales.